If you’re looking to replace your missing teeth, why not get the most state-of-the-art solution dentistry has to offer? Dental implants give Dr. Fifadara the ability to literally rebuild a patient’s smile from the roots up, so if you’re ready to reclaim both your bite and confidence, she’s more than ready to help you. Implants are designed to look great and last a lifetime, and you can get everything you need to enjoy a renewed smile right here in Fulshear. To schedule a consultation, contact us today. 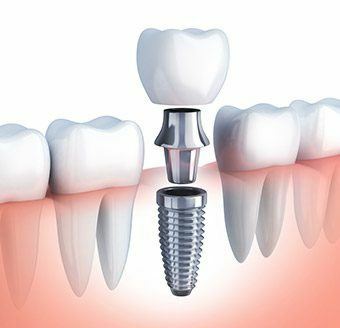 Why Choose Fulshear Dental for Dental Implants? All-inclusive implant care – we perform the whole procedure! Complete Solution: The reason patients and dentists alike love dental implants is because they restore an entire tooth both above and below the gum line. A prosthetic titanium root is placed into the jawbone that’s used to support all-porcelain restorations, giving them an exceptional stability that is second only to real teeth. Natural Appearance: Dental implants are built just like real teeth, so they look just like real teeth as well. The porcelain restorations are custom-made by a local dental lab to perfectly blend with a patient’s smile. Bone Preservation: When a tooth goes missing, the jawbone in the area naturally starts to shrink and deteriorate. Implants can stop and even reverse this process, protecting the foundation of the remaining teeth as well as the shape of a patient’s face. Durability: With standard oral hygiene, a dental implant can look and function like new for well over 3 decades. Whether you have a single gap or are in need of a complete set of dentures, dental implants can be used to give you a smile that looks and feels just like it did prior to tooth loss. Instead of filing down two healthy teeth to support a bridge, a dental implant root can be positioned between two teeth to hold a crown that closes the space in the smile. This approach helps preserve more of a patient’s natural teeth. 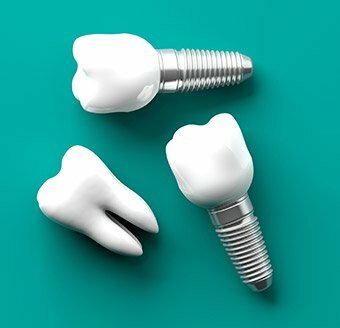 Dental implant crowns can be placed throughout the mouth as needed, and a small number of roots can even help secure a partial denture. For patients with consecutive missing teeth, just two implants can hold a bridge that restores up to three teeth in a row. If you have a denture that is constantly shifting around in your mouth, dental implants can help you finally get a new set of teeth you can trust. It only takes 4-6 implants to support a full denture that will stay very solid within the mouth, allowing a patient to eat whatever they like. At most other dental practices, patients are forced to visit at least two doctors in order to get dental implants: an oral surgeon to place the roots, and then a general dentist for the custom restoration. 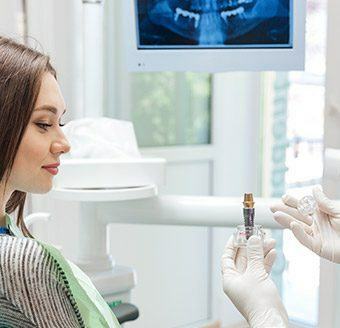 This adds time and expense to the process, which is why Dr. Fifadara is happy to perform the entire procedure herself right here at Fulshear Dental. She has dedicated countless hours to advanced training in order to do this, helping patients receive the care they need in the most efficient and affordable way possible. As you can see on the page above, dental implants can be used in a variety of ways, so there is no one cost for the treatment. Depending on how many teeth are being replaced and where they are located (among many other factors), the price can vary quite a bit from patient to patient. Our team can let you know what you’ll be expected to pay when you come in for an initial consultation. While dental implants do tend to cost more than traditional bridges or dentures, they are an investment that will last for decades. Implants only require consistent oral hygiene and checkups to function well for 30+ years, while other prosthetics typically have to be replaced every 5-7 years on average.